Also, while we did accept members daily during the week in June we will still be accepting members on Monday of each week. If you do have any questions please don't hesitate to reach out to the recruitment leadership to answer those questions. 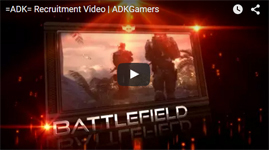 So are you interested in joining the =ADK= Gaming Community?! Just click the button below for more information and to fill out your application to get the process started!